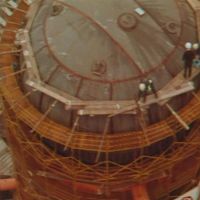 The fountainhead: Workers stand atop the 32-meter-high containment vessel of reactor 1 at the Fukushima No. 1 power plant when construction was under way in the late 1960s, in an image from the documentary "Reimei" ("Dawn"). | TOKYO ELECTRIC POWER CO.
Yukiteru Naka, a former employee of General Electric who took part in designing and operating reactor units 1, 2 and 6 at the Fukushima No. 1 nuclear power plant, is just one of a few engineers whose knowledge spans the facility’s 40-year history. Naka recalls that he and many of his colleagues had a lingering question about the plant at least since the mid-1980s: Why were the backup emergency diesel generators and DC batteries still located in the turbine buildings’ basements? More than two decades later, on March 11, this concern became a waking nightmare, although the water came from a different source. The giant tsunami created by the Great East Japan Earthquake overwhelmed the plant’s meager defenses, flooding the basement levels of the turbine buildings for units 1, 2 and 3 with seawater and destroying all of the emergency backup power systems, which eventually led to the meltdown of hundreds of fuel rods in the three reactors. Interviews with former engineers and an examination of documents by The Japan Times show it was GE that decided to place the critical backup systems in the turbine buildings’ underground floors, and plant operator Tokyo Electric Power Co. did not allow any alteration to the U.S. company’s blueprints. The turbine buildings were also designed for only Class-B quake resistance under Japan’s nuclear power plant regulations, the second-highest ranking under the system in place at that time. Placing the critical generators in the basements of the turbine buildings left the plant vulnerable to the tsunami threat, former nuclear plant engineers say. “I didn’t know until March 11 that the diesel generators were placed in the turbine buildings. If I had known, I would have definitely changed that,” said Masatoshi Toyota, a former senior vice president of Tepco. Toyota was one of the Tepco executives who oversaw the construction of the Fukushima plant. “This accident would have been prevented if the generators had been placed inside the (more tightly sealed) reactor buildings,” Toyota said during a recent interview. Under national regulations, backup generators were classified as equipment of Class-A importance, the top rank, and usually housed in a structure rated for Class-A quake resistance — most typically the super-robust, tightly sealed reactor buildings. Some engineers long had concerns over this apparent misplacement of the critical backup power systems. But Tepco, conservative by nature, didn’t allow the Japanese companies building the plant to make any alterations to GE’s basic design, said Tadaharu Ichiki, a 75-year-old former nuclear plant designer at Toshiba Corp.
“For Fukushima No. 1, we only (manufactured and) provided equipment (such as the reactor vessels), leaving all (of the design work) to GE because that was Tepco’s policy. That’s why the diesel generators were placed in the underground floors” of the turbine buildings, Ichiki said. 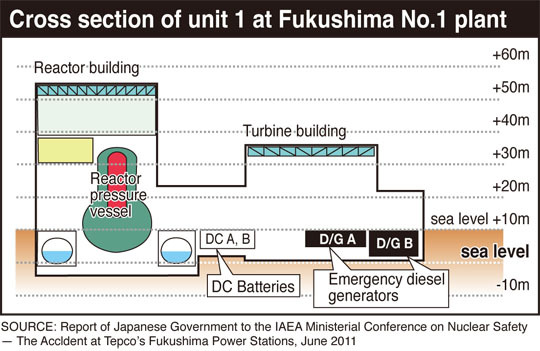 Former GE engineer Naka pointed out that most of GE’s boiling water reactors — the same type as unit 1 at Fukushima No. 1 — in the United States were built along rivers to take in coolant water, not near the sea. “So GE’s design concept did not put much emphasis on tsunami,” he said. Responding to an inquiry from The Japan Times, GE-Hitachi Nuclear Energy International LLC, GE’s nuclear unit for operations in Japan, said it is currently unknown why the emergency diesel generators were located underground at Fukushima No. 1. But GEH stressed the plant was built at a height above sea level considered sufficient to guard against all the possible tsunami threats at that time. “It is GEH’s understanding that the constructed site elevationwas selected because it was believed to be higher than the highest historic tide, tsunami and typhoon that could affect the site,” GEH said in an email. As GEH pointed out, it is true that neither Tepco nor Japanese nuclear regulators had expected tsunami of the height — about 13 meters — that swamped the plant on March 11. The Japanese regulators also approved the equipment layout plan submitted by Tepco in 1966 when it sought approval to build the first reactor there. The Nuclear and Industrial Safety Agency admitted that DC batteries and backup generators for nuclear plants are classified as Class-A equipment. But as long as the regulators judge that Class-A equipment wouldn’t “lose functions” in the event of a huge earthquake, the government approved placement of Class-A equipment in a structure with weaker quake resistance. That was the case with the government’s assessment of the Fukushima No. 1 plant, a NISA official said. The Fukushima plant is one of the oldest in Japan and Tepco’s first. The utility’s priority appears to have been to adhere to all of the American designs exactly as they were. 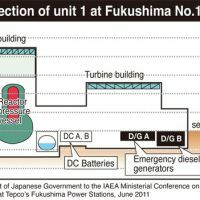 Units 1 and 2 were built under a turnkey contract between GE and Tepco — which means GE was fully responsible for designing and building the facilities, and all Tepco had to do was operate it. Later, Toshiba and Hitachi Ltd. became the main contractors for building units 3, 4 and 5, following the basic plant designs by GE. “Tepco told us to build units 3, 4 and 5 (of Fukushima No. 1) exactly the same way as GE did (in building units 1 and 2). In some extreme cases, we were told not to change even a bolt,” he said, adding that at the time, Toshiba and the other Japanese makers were just getting started in the nuclear business and their knowledge was inferior by far to that of GE, Ichiki said. When building the Fukushima No. 2 plant, Toshiba engineers proposed modifications to GE’s original design, but Tepco blocked any major changes, Ichiki said. “If you want to put it negatively, Japanese makers were still incapable at that time. We couldn’t decide the layout of any piece of equipment,” Ichiki said.